Happy almost Thanksgiving to all my American readers! And to everyone else; we may not get pumpkin pie this weekend, but we do get amazing Black Friday sales. For the past few years Black Friday has really turned into a week long event (hence the name cyber week) and many of the sales start TODAY! Of course the internet is filled with bloggers talking about the sales… so what makes my post today different? I’ve done the digging for you. What I mean by that, is that I have complied a comprehensive guide to Black Friday / cyber week sales and have listed them by store but also by what type of item you might be looking for. On the hunt for a holiday party dress? Scroll to the party dresses category below to see my top picks from a bunch of different retailers with sales. So much easier than digging through every website yourself! I’ve broken down the categories into the main things I think you may be looking for this cyber week. I hope you love my picks, and find a ton of great sale items. Be sure to head to my instagram stories to see try on videos sharing a number of my favorite sale items. And come back tomorrow for a follow-up post with any new retailers that start sales tomorrow. Let’s get to it. Here is your comprehensive guide to Black Friday / Cyber Week sales! Baublebar: 35% off everything. Plus, new $10+ doorbusters! Le Chateau: 50% off suits & suiting separates, 50% off dresses, 30% off coats/jackets, up to 50% off shoes, & more! SheIn: Buy more, save more: $39 off $230 or more, etc. Plus up to 75% off coats and jackets! One; It allows you to shop designer brands at prices you won’t find anymore else because of the buy more, save more style of the sale. This is when I stock up on my beloved Alice & Olivia pieces! (Ps. if you don’t know my obsession with Alice & Olivia – check out my post recapping their New York Fashion Week presentation!) An example of what I mean by the sale: if you get the black with white trim blazer and pants pictured below, you would end up getting them for 25% off. Nowhere else will you get brand new Alice & Olivia pieces for 25% off!! 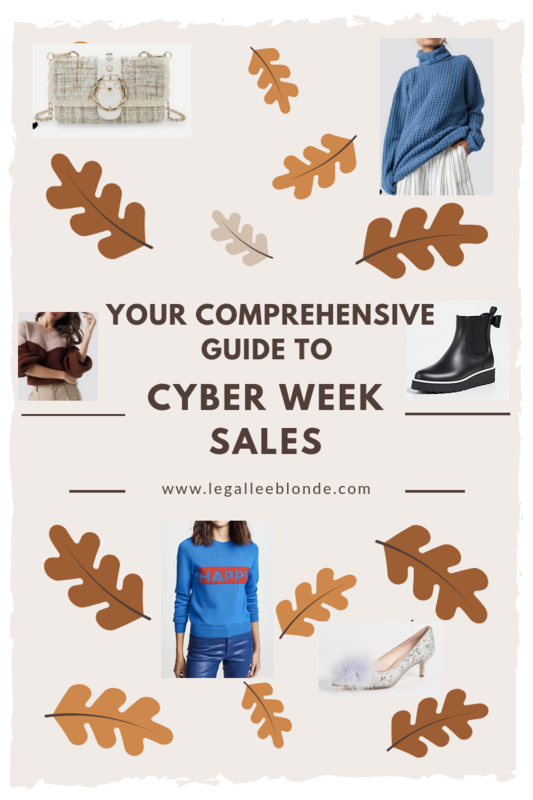 Hope you enjoyed this comprehensive guide to Black Friday / Cyber week sales! Happy shopping! "Four NEW Cyber Week Sales"
So many amazing sales! I am not sure where I want to shop online yet but I know I’ll get some amazing deals! There are so many great ones this year! I won’t be shopping any sales, but girl, you have a few pieces on here that are really tempting me: that color block sweater, the croc panel high boots and that Prabal Gurung cape dress! Aw i feel ya – so many tempting items! The ultimate guide!!! So ready to do some shopping. This is great! Round up posts are always so helpful for me. Looking forward to scoring some great deals! Same here – I can’t wait to shop after work today! There are so many good sales right now. I can’t wait to shop. Same here girl! I’m going to sit down and do an online shop tomorrow night! So excited for Black Friday shopping and 50% off at Express! Definitely shopping their sale! That’s a phenomenal guide. Thanks for putting it all together. Super helpful to shop. Thank you so much Tanvii! It took HOURS, so I;m glad people are liking it! Oooo I love all of these picks! So many cute items on sale! Soo many amazing pieces!!! I love that green plaid coat!! So excited for these sales! I’m loving that blue turtleneck sweater, it’s fabulous!! Thanks so much Cathy! happy shopping! There are so many awesome deals going on right now!! Definitely stocking up on some pieces for Fall and Winter! This is such a helpful roundup of all the sales! There are some really good ones this year! Haha hope you’re enjoying girl! Awesome roundup of deals– you have so many great picks! Great sale picks! I stocked up on some new jeans and sneakers! Thanks Anna! And good call! I still need to grab some new denim styles for winter. So many great sales!! Loving your picks! I can hardly believe that faux pearl bag is from Shein!! Thanks Laura! And right??! Such a great steal! So many great deals and sales! Good for me and bad for my bank account! Haha I feel the same way girl!! Such a great list! I definitely hit up most of these sales hah!